I guess I have some need for penance, some need to self-flagellate. It's the only explanation I have for doing events like this. 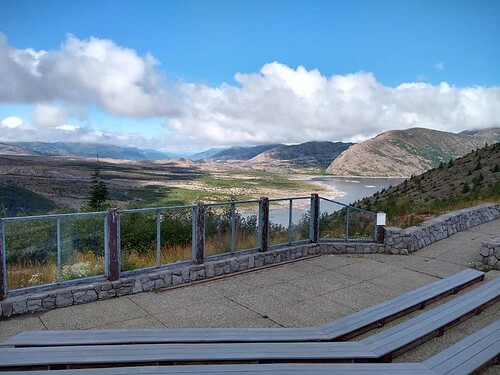 With that, I bring you the Cascade Bicycle Club's High Pass Challenge, a 104 mile out-and-back ride from Packwood, WA, to the Windy Ridge overlook on Mt St Helens, and back. The real story, though, is the 7500-some feet of ascent along the way. I'd had this event on my list of possibilities last year, but opted to pass. My mileage had suffered greatly with the efforts to sell our house, and it fell right in the time we were looking at moving into a temporary location. 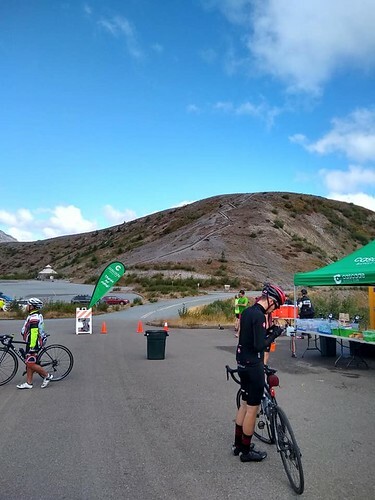 I signed up about a month ago, did some final prep rides with a lot of climbing, and relied somewhat on the base that got me through the Ellensburg Gran Fondo in June. Then I kept an eye on the weather forecast... And watched the approaching lower temperatures and rain. The ride is scheduled on a Monday to avoid traffic in what is a fairly popular tourist destination. The weather further helped, as longer range views, and the mountain itself, were obscured by clouds. Ride morning dawned (okay, I was up well before dawn) to a wet car and sporadic misty showers. I made the drive to Packwood in good time, arriving just before the registration tables opened. An hour previous to the ride start provided the time to get gear together, make the last pit stops, and line up with 200 of my new best friends. We rolled out at 7am, and within a quarter mile of the already wet highway, it began to rain. I had opted to don my vest over wool base layer and jersey, and I'm glad I did. The rain continued over the first eight miles or so, adding to the nervous energy expenditure of staying with the lead pack. At one point a log-loaded semi turned onto the highway next to us (in the oncoming lane) and proceeded to move over into the peloton. This caused a bit of mayhem as riders dove for the shoulder, hitting the brakes with varying effectiveness. No one kissed pavement, though, so we pushed on. This did, however, cause a bit of a split in the group, and I was in the second. It wasn't long before it was well strung out, and by the time we hit the real climbs entering the park, we were at one's and two's. Everyone for themselves. I stopped at the first food station to refill a bottle and grab a cookie or two. It was at this point that I realized I hadn't started the recording on my Garmin, so if anyone looks at my online profile there it appears I cheated. Honestly, I did the whole thing! Anyway, I then forged on up the road. Fifteen miles of climbing only briefly interrupted by flat sections or short downhills. Lots of back-and-forth passing of riders as the pitch varied, noting differing pedaling styles and gearing. I found myself in my lowest gear for long stretches, but I think I nailed my needs well -- I wasn't wishing for any lower gearing at any point. The roads were still wet for much of the climb, but in the last few miles the dry patches increased, and the sun broke through the clouds. The last several miles are above the tree line, and the landscape become much more open. I passed one rider who made a comment about maybe hitting the "gold standard" at the top. I knew they timed the first half of the ride (up to the lookout), but had no idea what he was talking about. Turns out it's an award level (gold, silver, and bronze) based on the time one hits the summit, given a 7am start (if you start late, oh well). I passed through the banners at the summit at 10:32 (and some seconds), just two minutes shy of the cutoff for that gold standard. So close. Most likely I could have eked out the two minutes somewhere, if I'd been aware of it. I lingered at the top for a while, wringing out my socks, refilling my water bottle, and getting some more food in me. Thankfully Windy Ridge didn't live up to its name on this day. The sunshine felt almost warm. 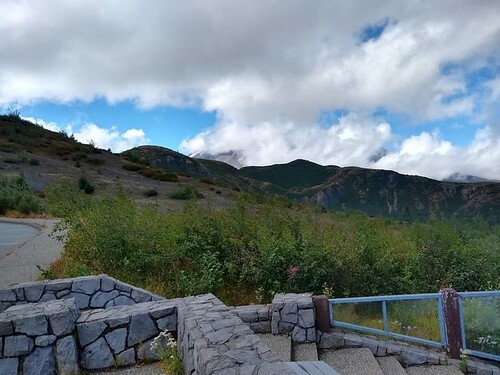 But the mountain, or what's left of it after the 1980 eruption, was being shy, hiding behind a bank of clouds. The return ride starts with a slight downhill, but then soon climbs a bit. Good to get the legs woken back up after the rest stop. But no one was in any mood to hurry back. Spinning the pedals lightly was the way to go. The long descent was over often sketchy pavement, missing completely in some places, replaced by packed gravel. Many depressions where erosion had hollowed out underneath (one particular hole looked to have an absolute abyss below the tarmac), checked areas where patching had broken away. I had to take my sunglasses off in order to see far enough into the distance to anticipate my path. But in all that, even with 23mm tires, I never felt in danger of flatting or losing traction. The last 20 miles back into Packwood were a search for a rider or two to tag along with. Mercifully there was no headwind, and the pace could be kept high. Like horses smelling the barn, we rolled fast into the finish. 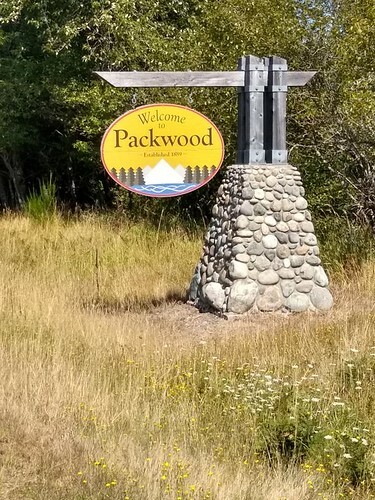 The "Welcome to Packwood" sign was indeed a welcome sight. Back at the finish, I changed clothes, got some food (provided by Cascade Bicycle Club), and spoke with other riders about the ride. Then it was back on the road for the trip home, tired, but satisfied with a hard day in the saddle. * Opting for the vest was a good choice. I think I would have been very chilled without it. It's a bit flappy, but the wind block was needed. * I wore gloves for the first time in I-don't-know-how-long, an old standard fingerless pair of Schwinn brand. I think going without would have been unwise. * Once at the first rest stop, I was filling my second bottle with Nuun rather than water. * Smartwool socks were... smart. The rain soaking kept my feet on the edge of going numb. * Smartwool base layer just worked. 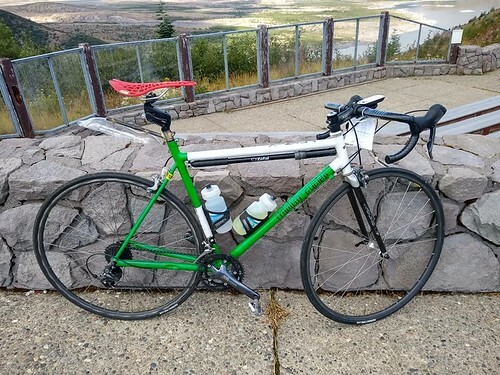 * The Kinekt seatpost kept things comfortable even on the worst of the sketchy pavement, and the miles of chip seal on the return trip down Hwy 12 back to Packwood. * One of my customers had given me a jar of his home-brew all-natural chamois cream. I had used some a while back, but just got out of the habit after a while. I restarted using it a couple weeks ago, and the difference is amazing. I told my wife after I got home that, yeah, I could do this one again. And with that two-minutes-to-the-gold-standard thing bouncing around in my head, I was already thinking about what I could do to make it up the hill just a little faster. I guess I have a goal for next time. Sometimes people just quietly go about doing something epic, something amazing, something good. They choose to make a difference, and get on with the task. And occasionally, it draws some attention. Hopefully this post helps draw some attention. 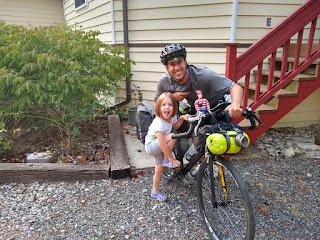 Matt Broshat is slowly making his way clockwise around the United States. By bicycle. Unsupported. He's doing it to raise money for Young Life Capernaum, a branch of the Young Life charity ministry that focuses on disabled children. His goal is modest: $25,000 raised through pedaling some 11,000 miles solo. I heard about Matt through his cousin, making a post on the Slowtwitch forum. He was starting out from Portland, OR, on August 8th. I read the post on the morning of August 9th. I looked at his route, and it seemed he was starting out by riding the Seattle-to-Portland route in reverse. Which, hey! just so happens to pass a couple miles from my house. I made a contact through his website, and quickly got a reply. After some back-and-forth, it was all set up, and around 6pm on Thursday, Matt rolled into our driveway. He was ecstatic over the prospect of a shower, bed, dinner, breakfast... Simple daily things most of us take for granted. After spending the previous night in his hammock, with sprinklers starting up around 2am, I can imagine that the accommodations were a considerable step up. Matt is affable, unassuming, and humble. He isn't out to make any money for himself on this trip, it's all for the kids. He has been involved with Young Life for some 8 years, a third of his life already. His ride is completely self-supported. I posted on Facebook after he resumed his journey on Friday morning, the next leg taking him into Seattle for the next day before turning east. I immediately got responses for folks willing to host him in Spokane, WA, and Bozeman, MT. I saw in his route feed that he's in Spokane now -- hopefully with one of the volunteer hosts. I wish Matt well, a safe journey, and generous people along the way. Take a look at Matt's proposed route, and if you're near, consider hosting him for the night. Or even offering a lunch, a cold drink, some encouragement. And maybe a donation to his cause.